I like ESPN. I like Sports Center. It is one of the best things to happen – both to folks with ADD – like me – and folks who love sports. I can catch-all the most important moments, know the score of any game, and all within just a few minutes. Its brilliant. This morning I caught the perfect highlight – but it was not the normal highlight. It was a “top ten,”but not Chris Berman’s. It was Barbara Walter’s Ten Most Fascinating people of 2011. Derek Jeter was one of ten. Now – I’m a Yankee Fan – always have been – but I am objective. I wouldn’t just throw this out on a blog – just because he is a Yankee. I wouldn’t do that. But – the interview was worth listening to because of what Jeter said about his parents. I think this is a big deal and something that is awesome. It isn’t often that famous folks point to the respect that they have for their parents as a driving reason for the way that they live. It is important for parents to see this – important for them to realize that what they do actually has a long time impact on their kids. What I think it important is that Jeter’s parents made things clear – they had goals and expectations and Jeter and his sister knew what they were. I think that’s a good idea. We ought to have expectations for our kids – they ought to know them and they ought to have expectations for themselves. Jeter isn’t perfect and I’m not advocating putting him on a pedestal. I am advocating listening to the interview and allowing that to shape a bit of our understanding of the impact of our parenting. It matters. The expectations we set for ourselves as parents and for our kids matter – and – it has an impact. 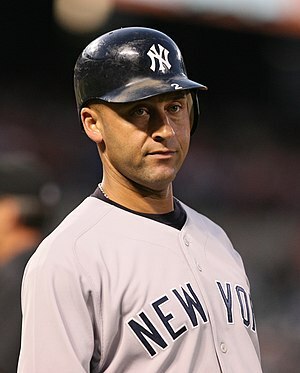 At least it did for Jeter. That’s a big deal.